Ever since the “Linux From Scratch” craziness went away I’m loving to do things “the distro way”. Doing so ensures you that your configurations won’t break when you do system upgrades and thus you can do the upgrades and be always patched and as safe as possible. Nginx is the new comer to the web server business and people seem to love it a lot. I love it myself, but sometimes you just have web apps that won’t work on nginx or web developers that did not embrace it so you need Apache to just do the job. 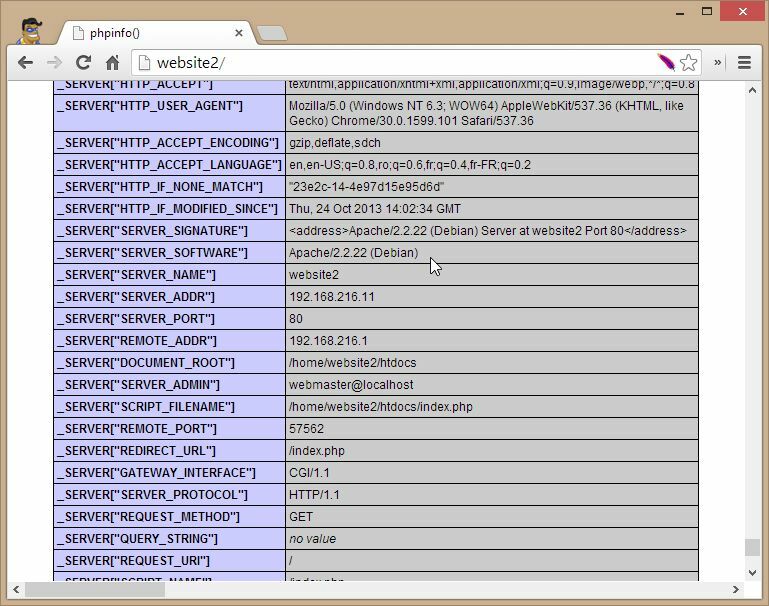 Ever since PHP 5.3.3 the FPM (FastCGI Process Manager) has been included so we could have PHP’s own FastCGI interface to run PHP code and serve the output to the web server. I’ve been using it with Nginx for a while, but I was never really interested in using this technology with Apache. Now it just seems fit to use it. Let’s say that we have a server running Debian 7 Wheezy, that has two public IP addresses. Here, for the demonstration purpose I will use 192.168.216.10 and 192.168.216.11 as the public IPs. This server was just installed, with just the standard system utilities and the OpenSSH Server. The first line is to ensure that the syntax will be highlighted when you open a file that has some syntax and the other lines make your editor put the cursor on the same position as it was the last time you edited the file. NOTE: RUNNING ALL PARTS OF THIS SCRIPT IS RECOMMENDED FOR ALL MariaDB SERVERS IN PRODUCTION USE! PLEASE READ EACH STEP CAREFULLY! In order to log into MariaDB to secure it, we'll need the current password for the root user. If you've just installed MariaDB, and you haven't set the root password yet, the password will be blank, so you should just press enter here. Enter current password for root (enter for none): OK, successfully used password, moving on... Setting the root password ensures that nobody can log into the MariaDB root user without the proper authorisation. You already have a root password set, so you can safely answer 'n'. Change the root password? [Y/n] n ... skipping. By default, a MariaDB installation has an anonymous user, allowing anyone to log into MariaDB without having to have a user account created for them. This is intended only for testing, and to make the installation go a bit smoother. You should remove them before moving into a production environment. Remove anonymous users? [Y/n] y ... Success! Normally, root should only be allowed to connect from 'localhost'. This ensures that someone cannot guess at the root password from the network. Disallow root login remotely? [Y/n] y ... Success! By default, MariaDB comes with a database named 'test' that anyone can access. This is also intended only for testing, and should be removed before moving into a production environment. Remove test database and access to it? [Y/n] y - Dropping test database... ERROR 1008 (HY000) at line 1: Can't drop database 'test'; database doesn't exist ... Failed! Not critical, keep moving... - Removing privileges on test database... ... Success! Reloading the privilege tables will ensure that all changes made so far will take effect immediately. Reload privilege tables now? [Y/n] y ... Success! Cleaning up... All done! If you've completed all of the above steps, your MariaDB installation should now be secure. Thanks for using MariaDB! 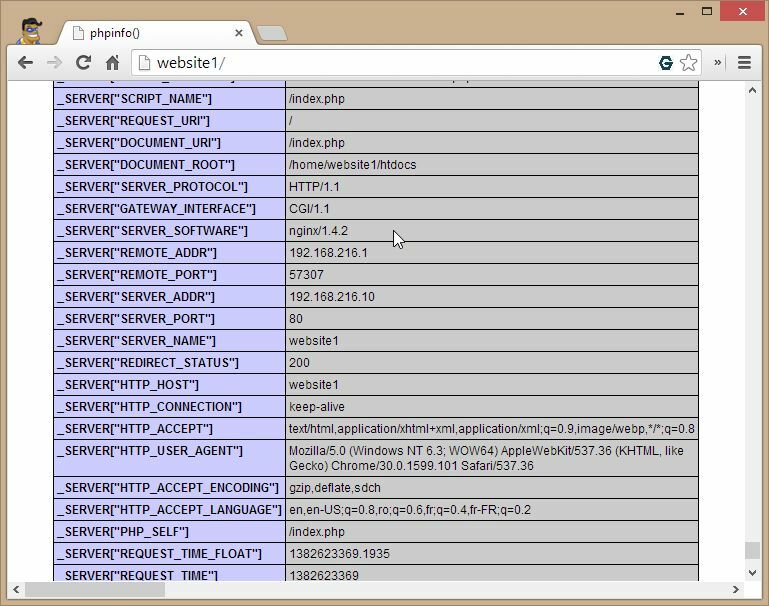 So, the way things go every website’s files reside under a different system user, under which we isolate each website’s own PHP processes pool so that they could read and write on the disc only as that user. Website files should be in /home/$user/htdocs, web server log files should be in /home/$user/logs and we also need a tmp folder that holds temporary files. After that we just poit our brwser to it.